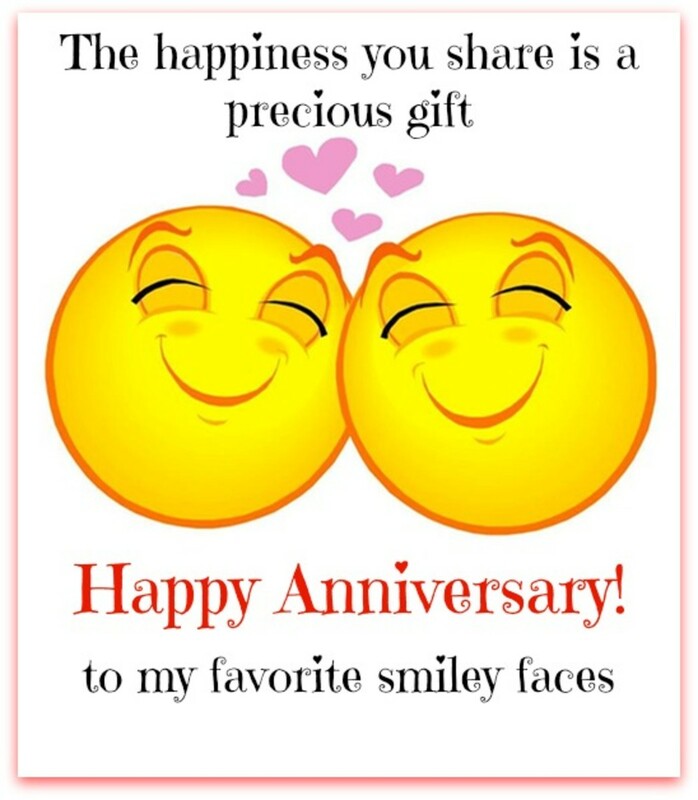 Need help figuring out how to send anniversary wishes to someone? 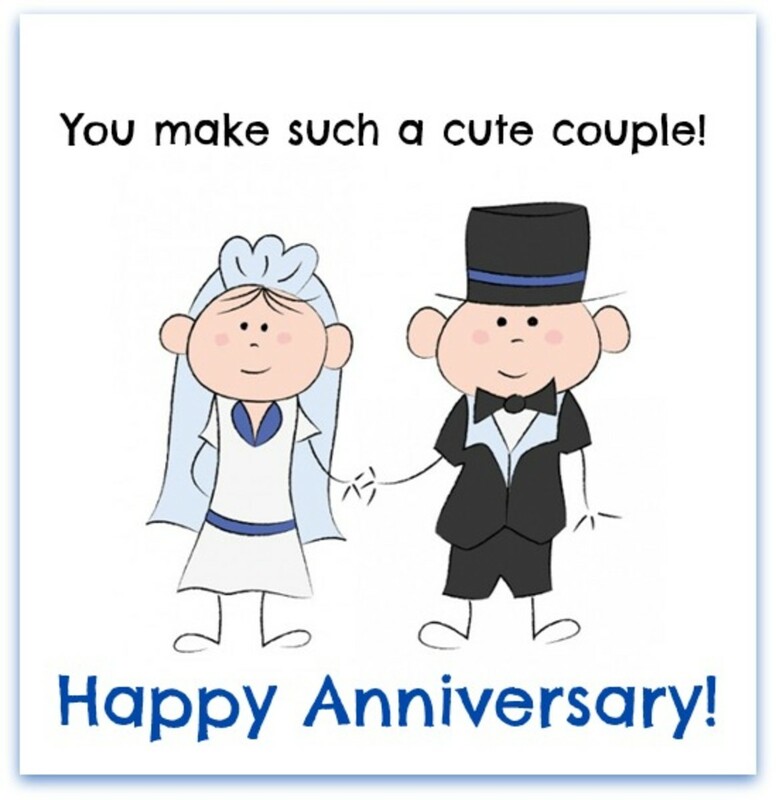 With over 50 "Happy Anniversary" messages, greetings, and cards, this is a good place to start. You may print any of these greetings as a folded card following the instructions in the video at the bottom of this page. 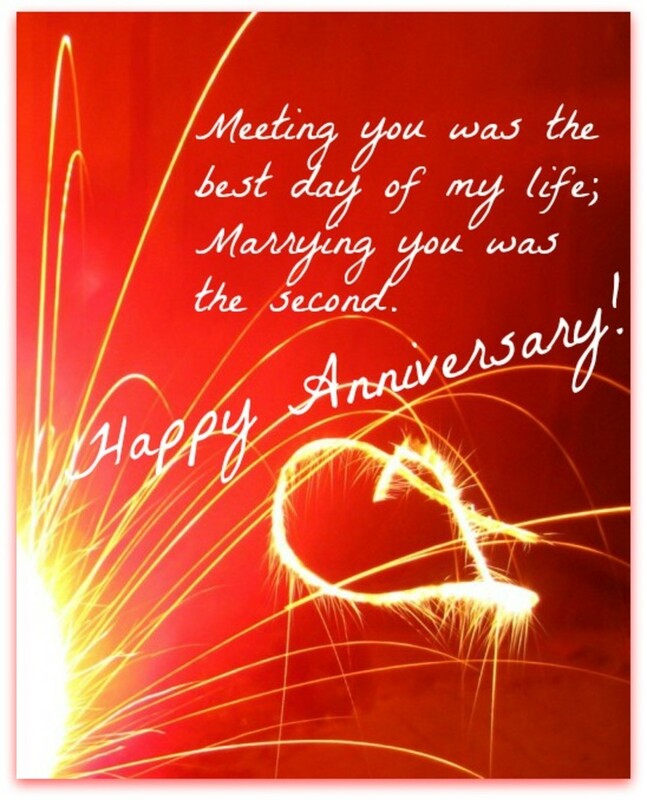 You may also send one of the marriage anniversary greetings as an email. Just right click on the wish you want to send and copy/paste to your email. 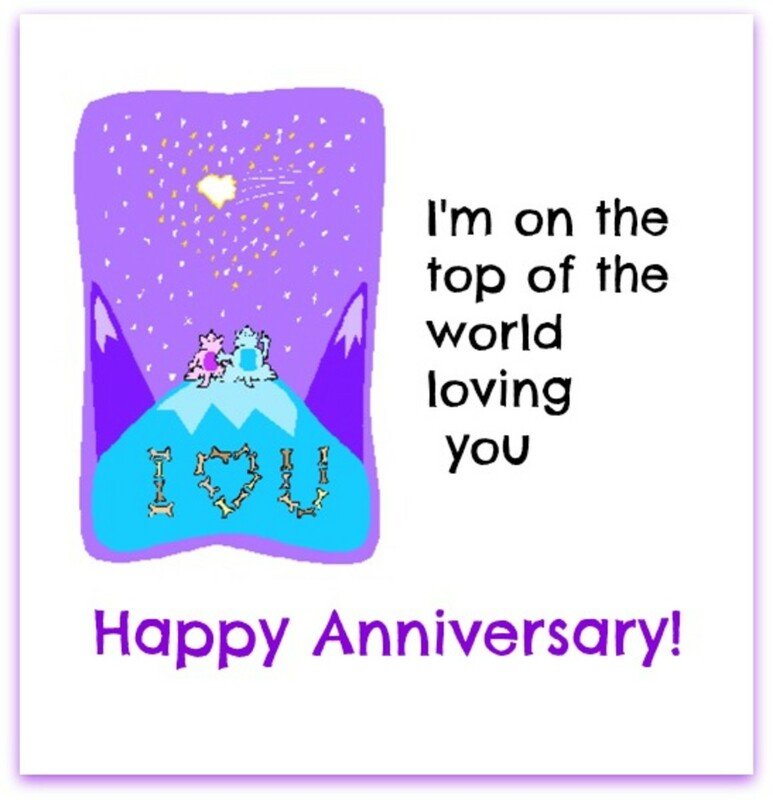 Sending a wish to your spouse on your anniversary by email is a fantastic way to say "I ♥ You." 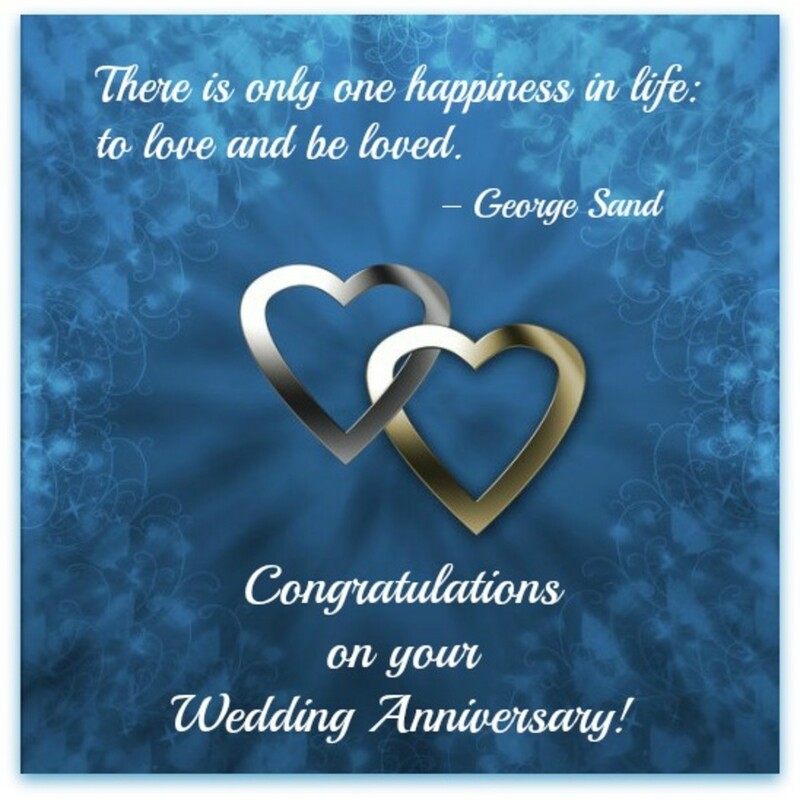 You can read the text messages to send for wedding anniversaries following the graphics in each section. 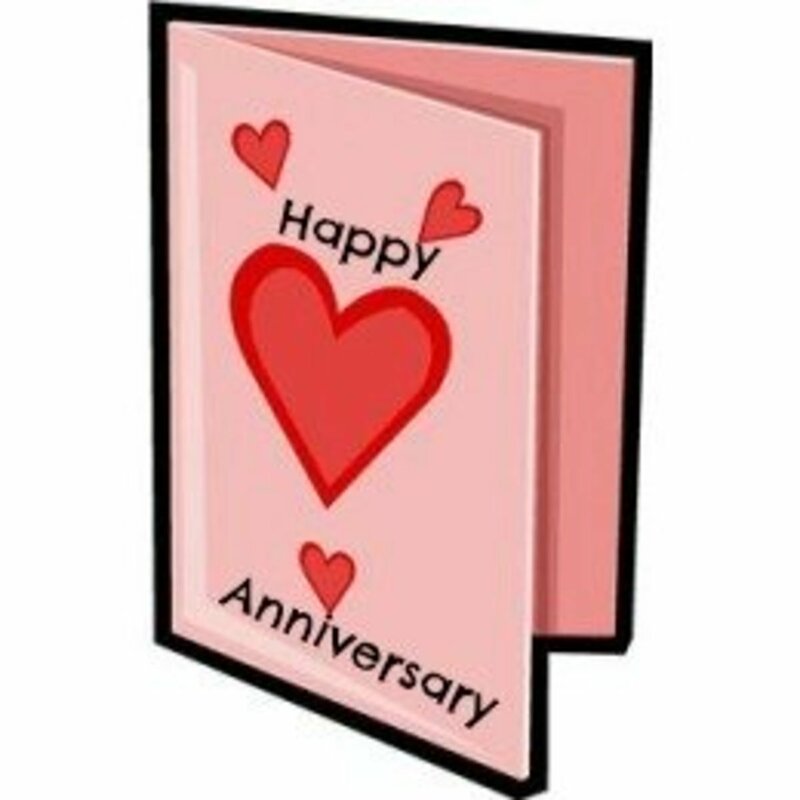 You may use any of these anniversary wishes for personal use. 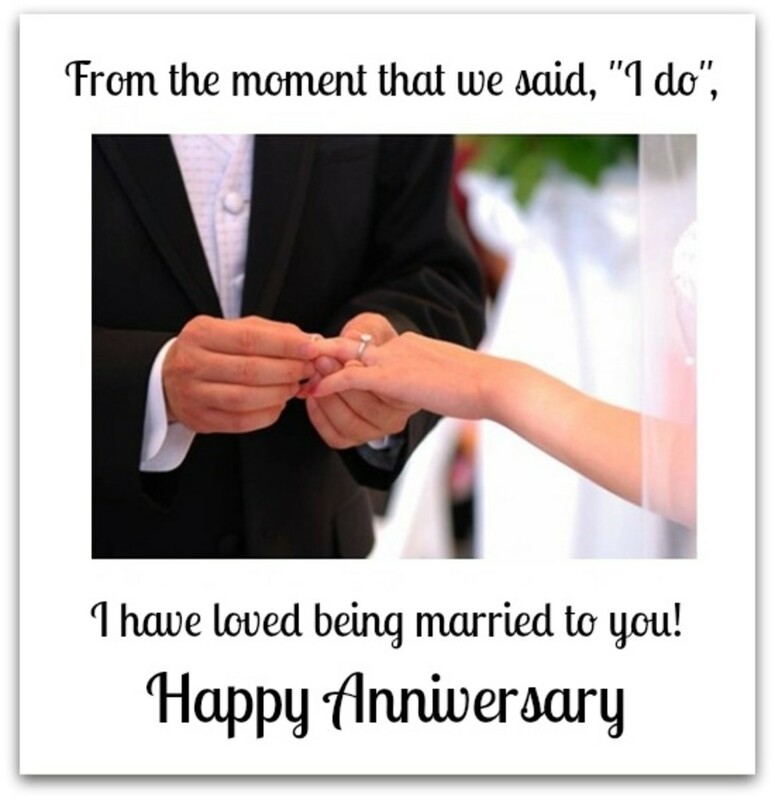 How do you find a new way to say 'I love you' to your spouse on your wedding anniversary? 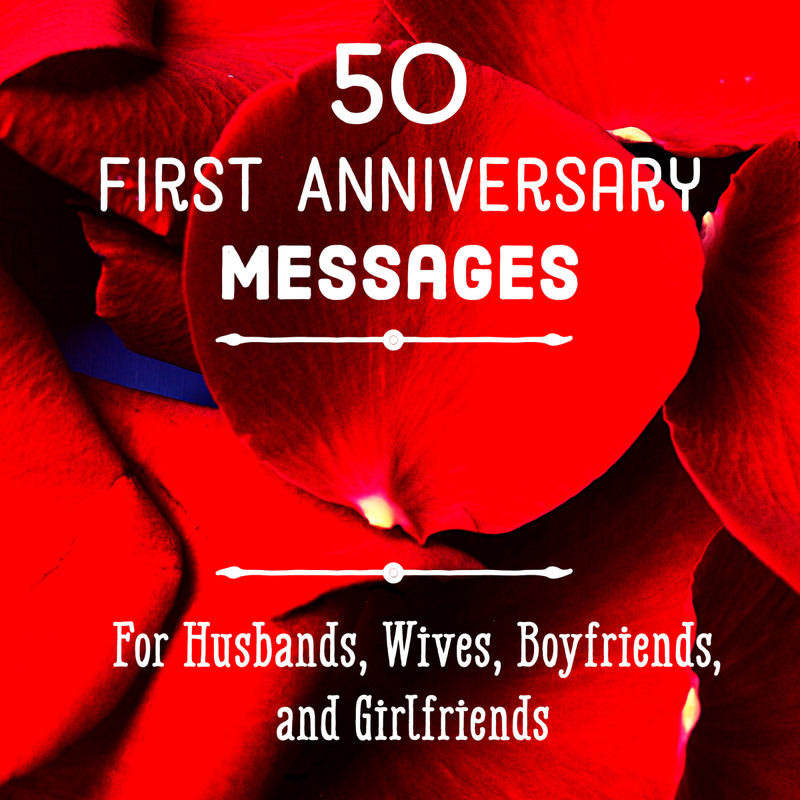 In this collection, you will find messages for husbands to send to their wives and for wives to send to their husbands. 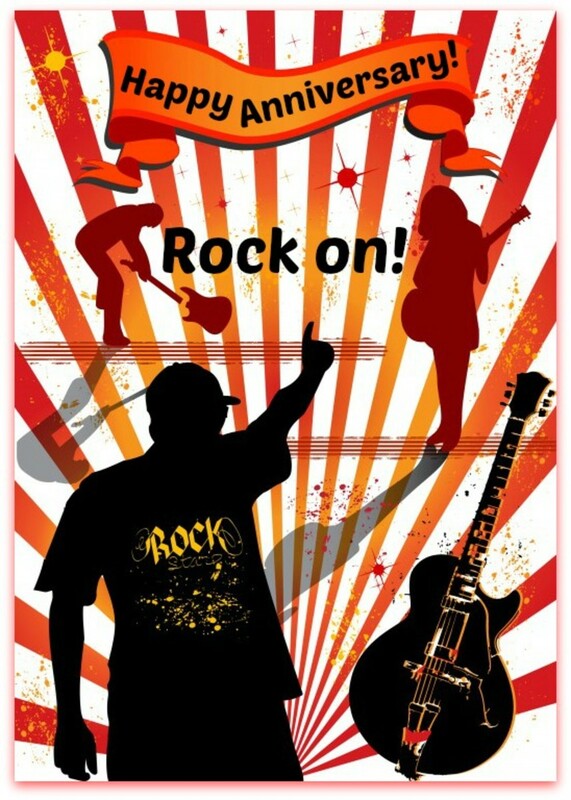 These messages are perfect to send in an email, or they can be used to create printable cards. You can also print these messages and fold them to create cards. If you need help with this, watch the video at the bottom of this page to find out how to print and make a card from the message you choose. You might also consider picking one of the messages below to use as the cover of your card and write your personal greeting inside. These notes are reminders of how important the marriage is to the sender of the message. As is appropriate, the messages reflect back and look forward. 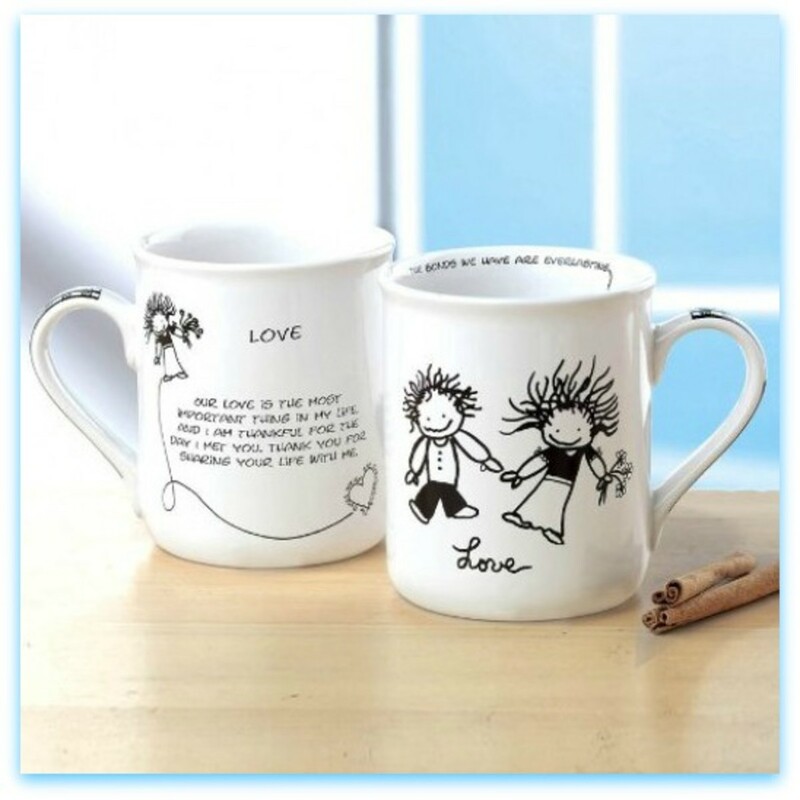 What a heart-warming way to celebrate your relationsup with coffee and breakfast in bed. This charming cup was designed by folk artist Lorrie Veasey and is made of high-quality dolomite ceramic. 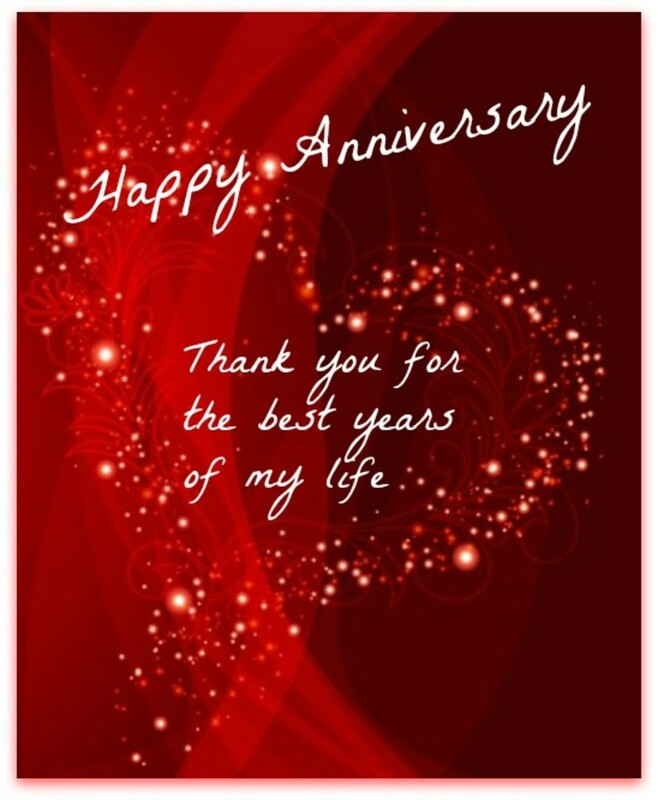 "Our love is the most important thing in my life and I am thankful for the day I met you. 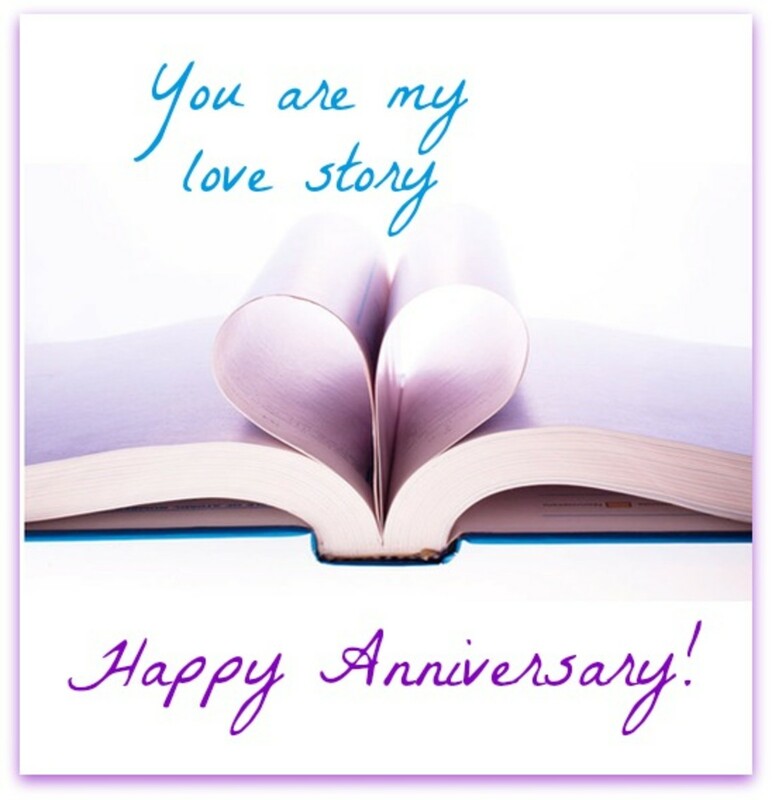 Thank you for sharing your life with me." "The bonds we have are ever lasting." The cup has surrounding design, front and back. It is the perfect greeting to start the memorable day. 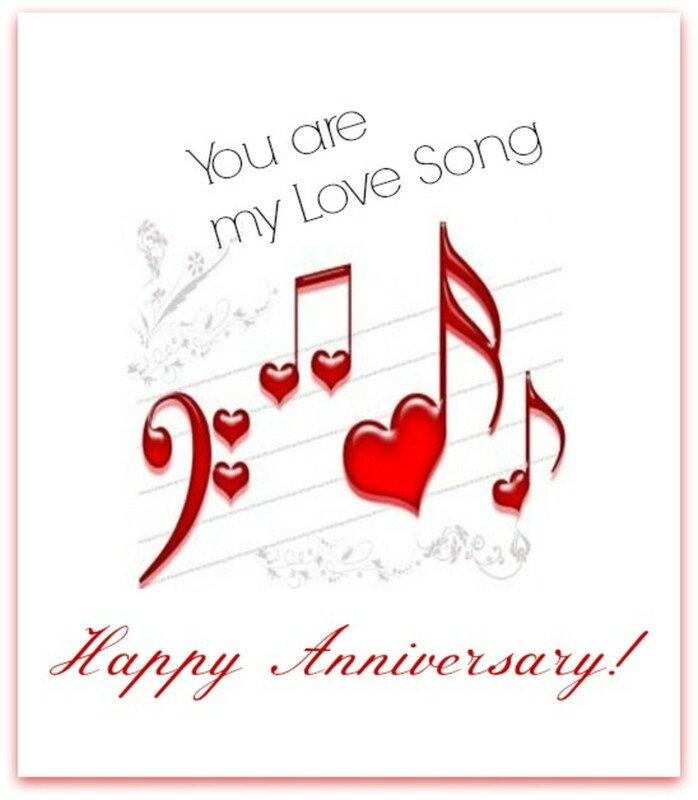 An anniversary is the time to say "I ♥ You" to your spouse. The greetings below will convey that message of love. 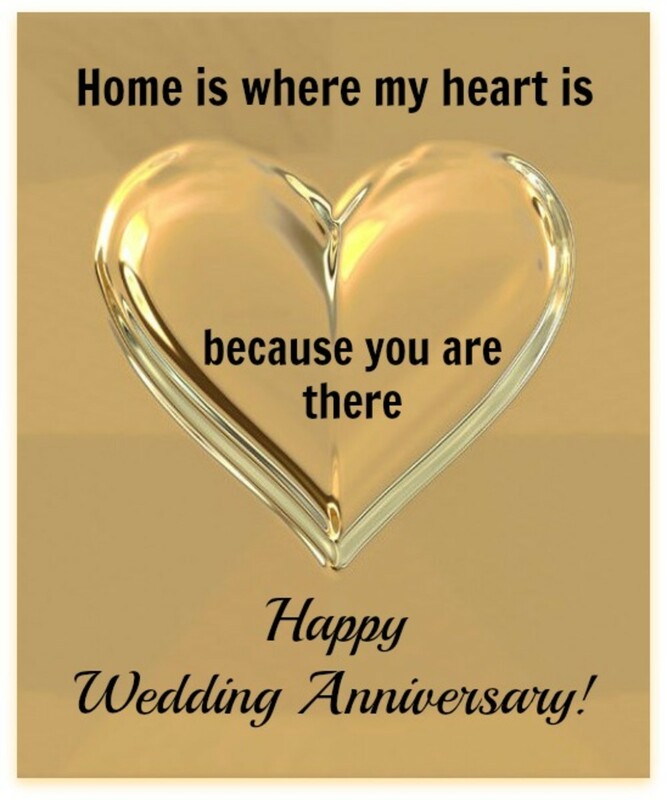 These special notes for your husband or wife are designed to touch the heart and to become special memories that spouses will want to keep. Is music a big part of your lives? This anniversary wish is for people who would rather read music than text. 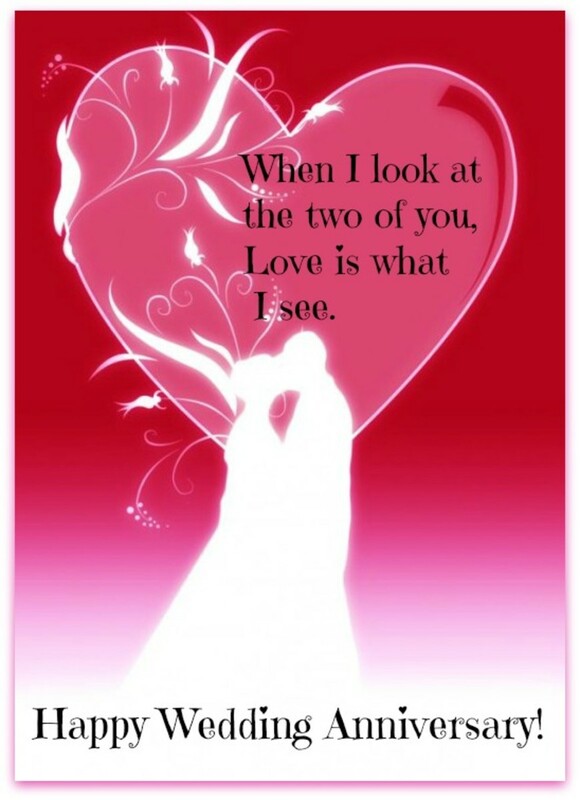 It's not one of those annoying, singing e-cards, but the words do sing "love." 14. 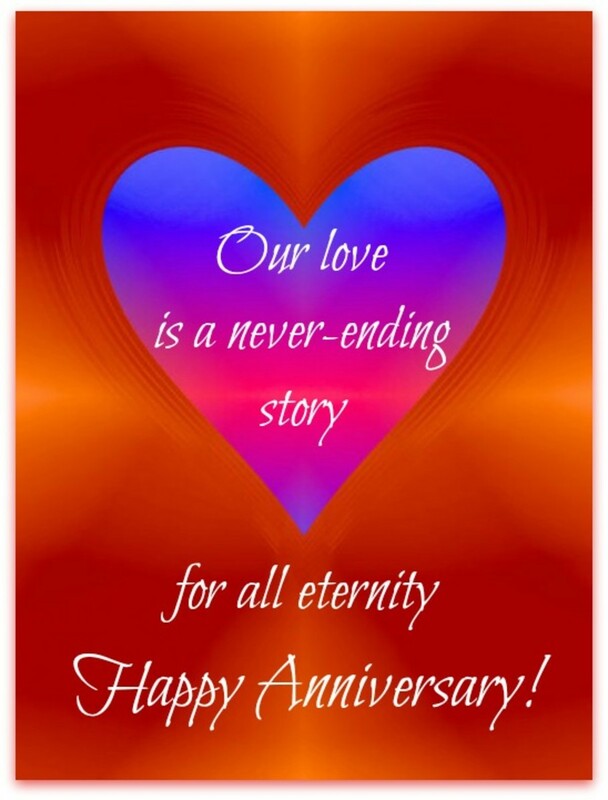 "Our love is a never-ending story for all eternity." 15. "Looking for love, the road stopped at you and I've never looked back." 16. 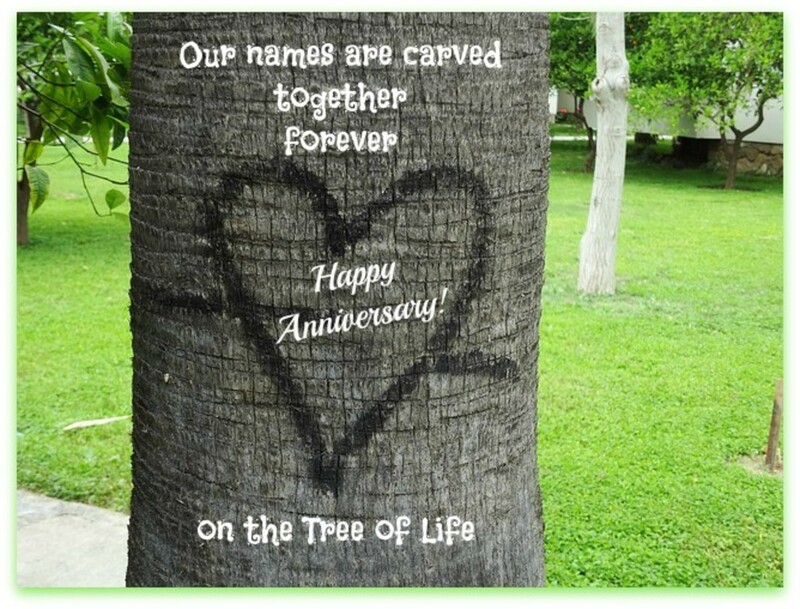 "Our names are carved together forever." 17. 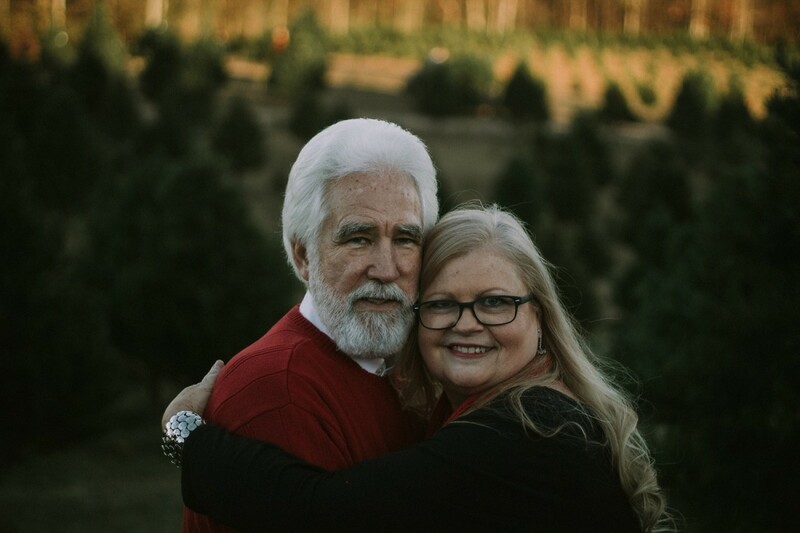 "Meeting you was the miracle that changed my life, and led to the day we became man and wife." 18. "Meeting you was the best day of my life. Marrying you was the second." 19. "You are the light of my life." 20. 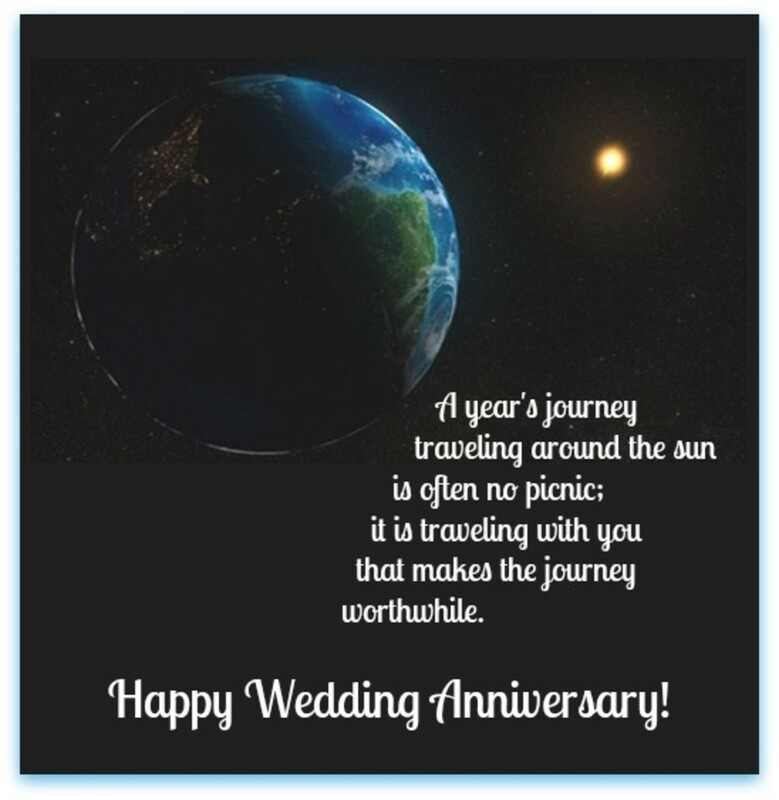 "A year's journey traveling around the sun is often no picnic; it is traveling with you that makes the journey worthwhile." 21. 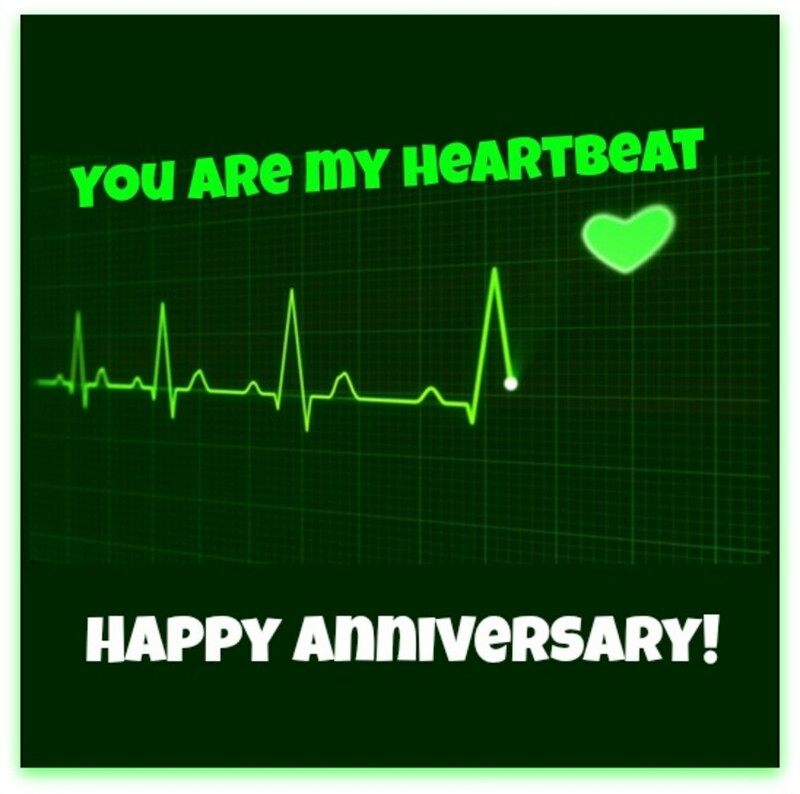 "You are my heartbeat." 22. "You are my love song." 23. "Two hearts that beat as one, that is what we have become." 24. 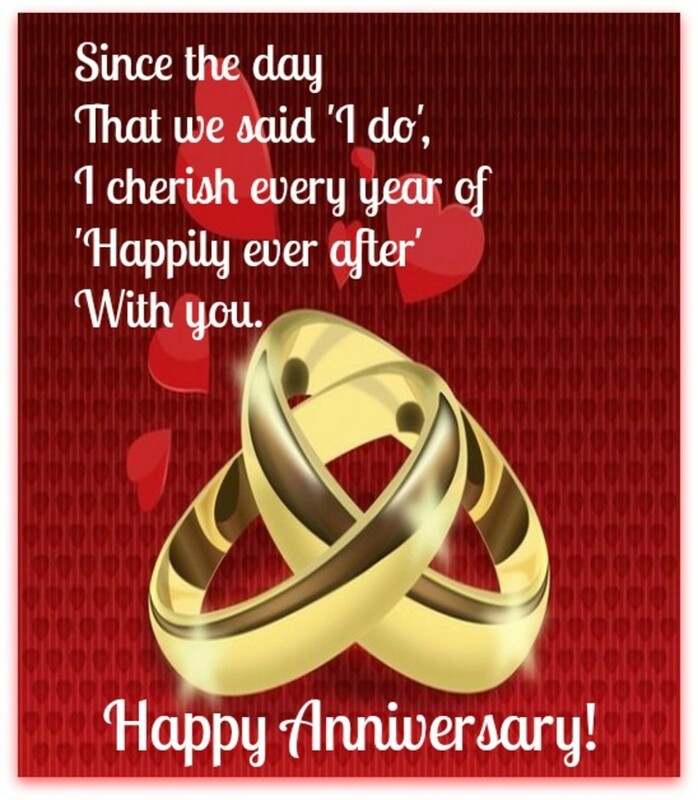 "Since the day that we said 'I do', I cherish every year of 'happily ever after' with you!" 25. 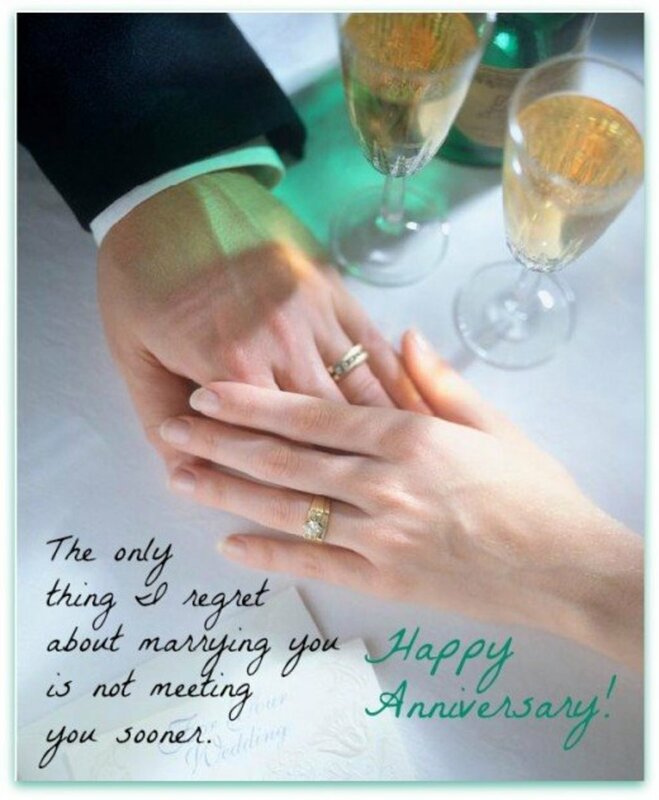 "The only thing I regret about marrying you is not meeting you sooner." 26. "From the moment that we said 'I do', I have loved being married to you." 27. 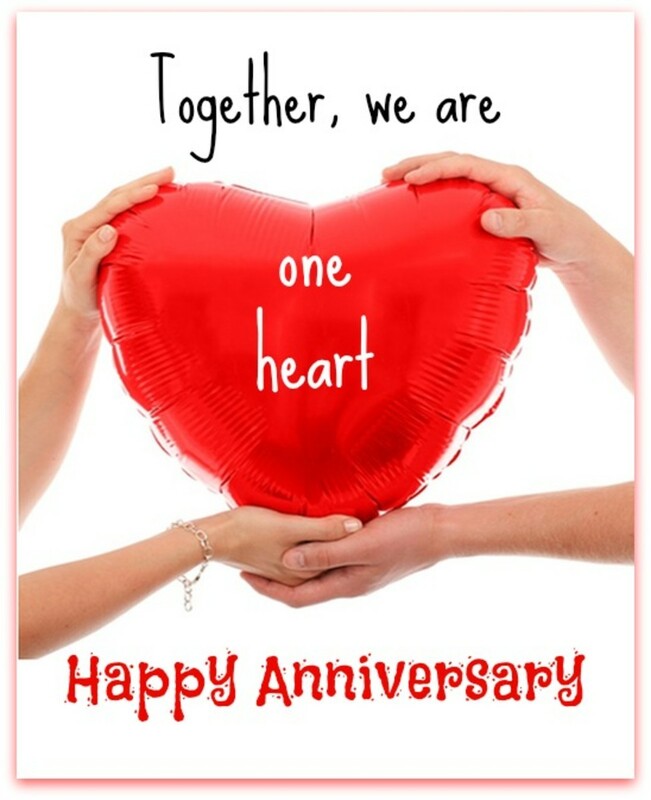 "Together we are one heart." 28. "You are the sweetness in my life. 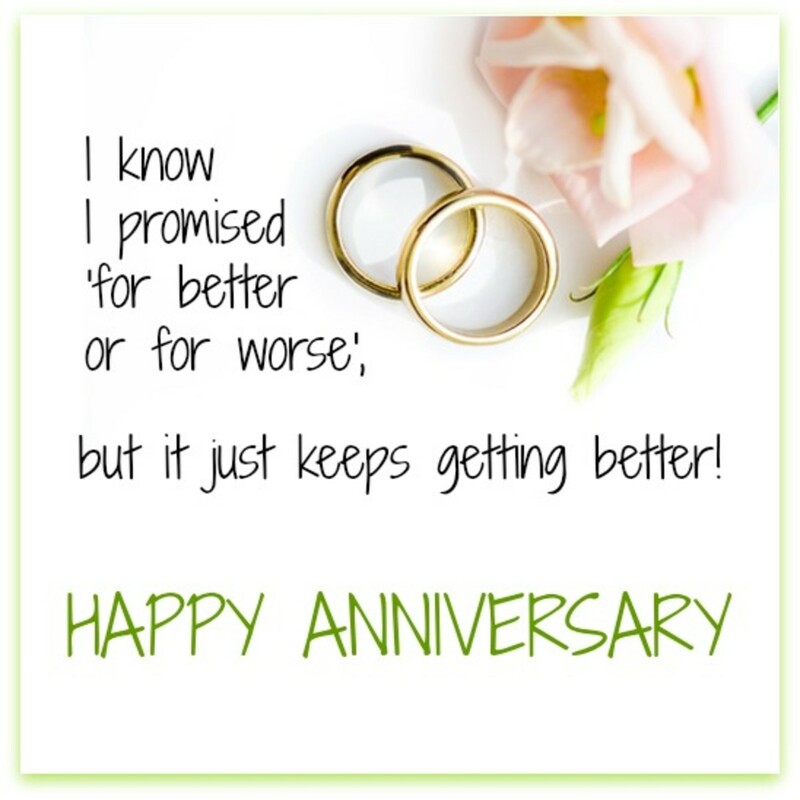 Happy Anniversary, Honey!" 30. "I'm on the top of the world loving you." These are some text messages that can accompany the graphics above or be used to make your loved one feel special any time of the year. 1. "Thank you for the best years of my life." 2. 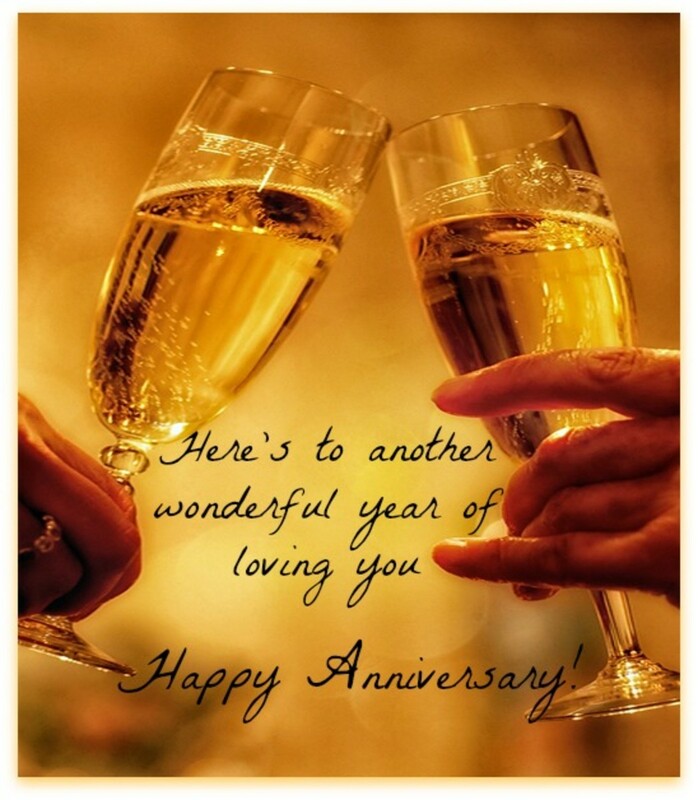 "Here's to another wonderful year of loving you." 3. "Even after all this while, nothing warms me like your smile." 4. 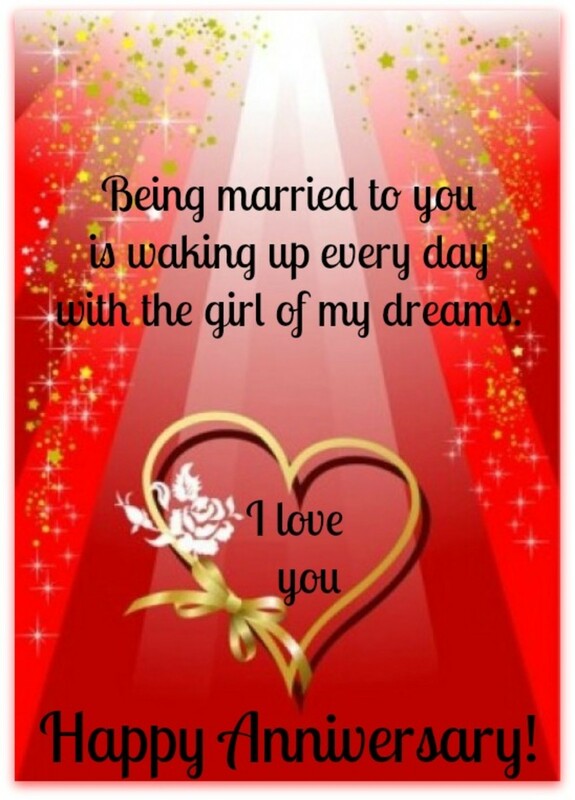 "Being married to you is waking up every day with the girl/man of my dreams." 5. "It's that time of year again: time to relive our honeymoon." 6. "I still have such a big crush on you." 7. "They say opposites attract. Sure worked for us!" 8. 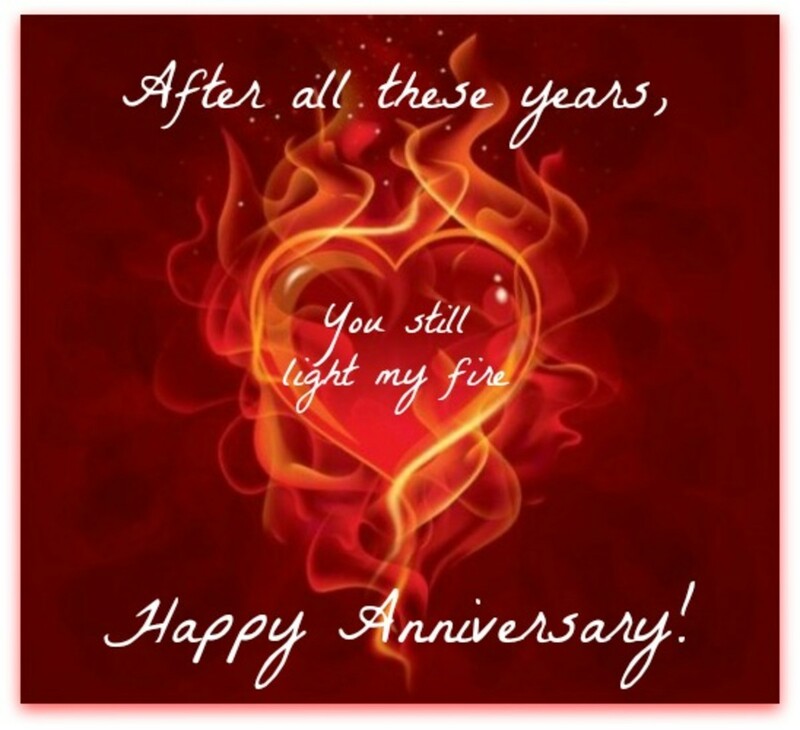 "After all these years, you still light my fire!" 10. "You are my love story." 12. "I know I promised 'for better or for worse'; but it just keeps getting better!" 13. "Home is where my heart is, because you are there." 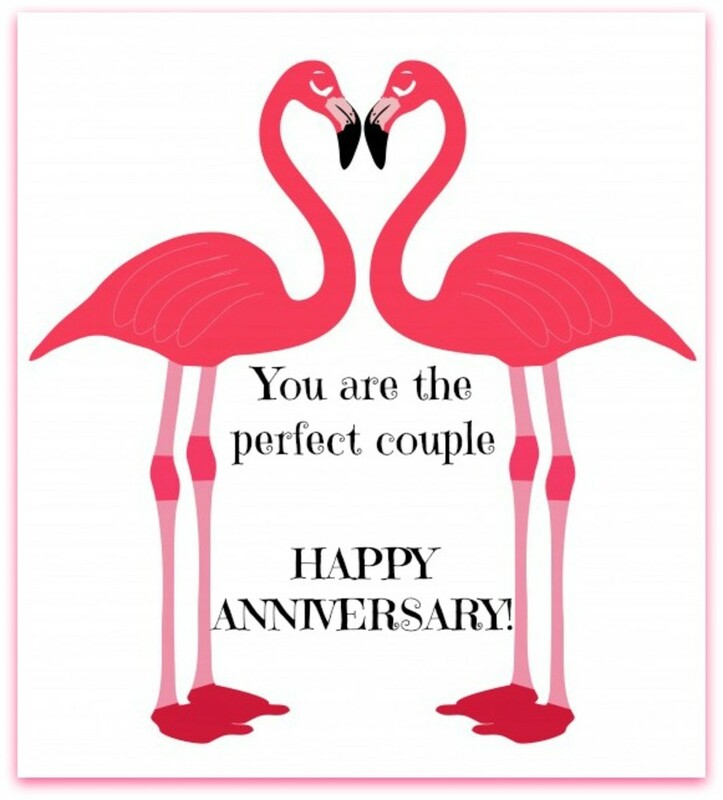 These "Happy Anniversary" messages are for you to send to the couple celebrating their anniversary. 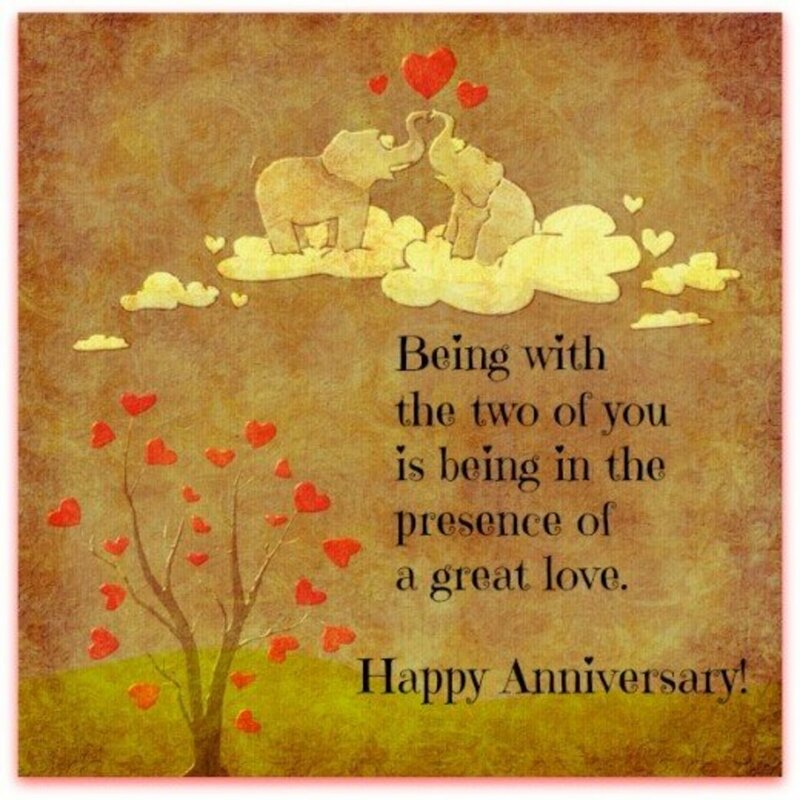 Here you will find greetings for all personality types and for all stages of commitment. There's something here for every couple – for couples you know well and for those you don't. These messages from friends and family members are always appreciated. The text messages in the graphics are listed at the end of this section. 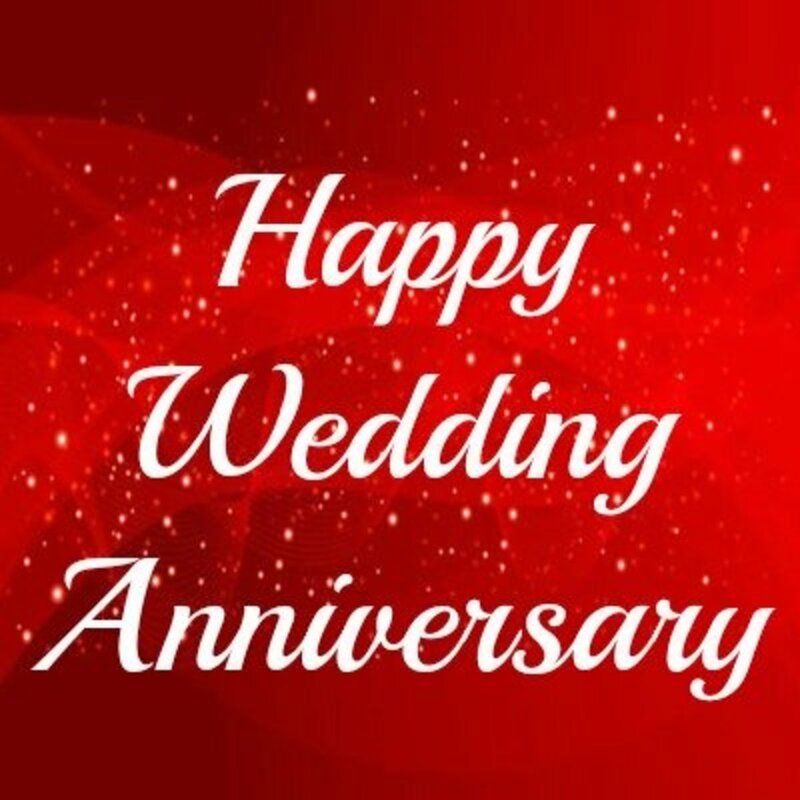 Celebrations are the order-of-the-day when a couple has an anniversary. You can't go wrong with a champagne toast and accompanying best wishes. 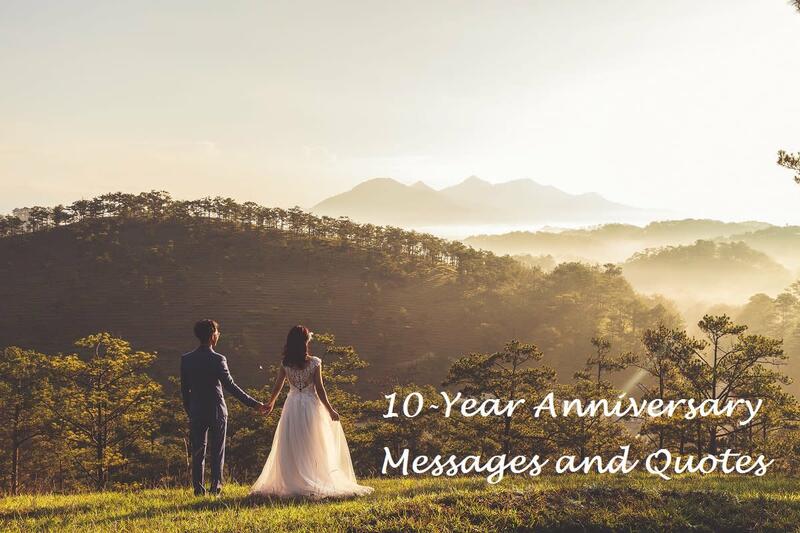 The wishes below are more thoughtful, sentimental anniversary messages. The text for the first one was written by the French novelist Amantine Lucile Aurore Dupin, who wrote under the pseudonym of George Sand. 8. "Being with the two of you is being in the presence of a great love." 9. 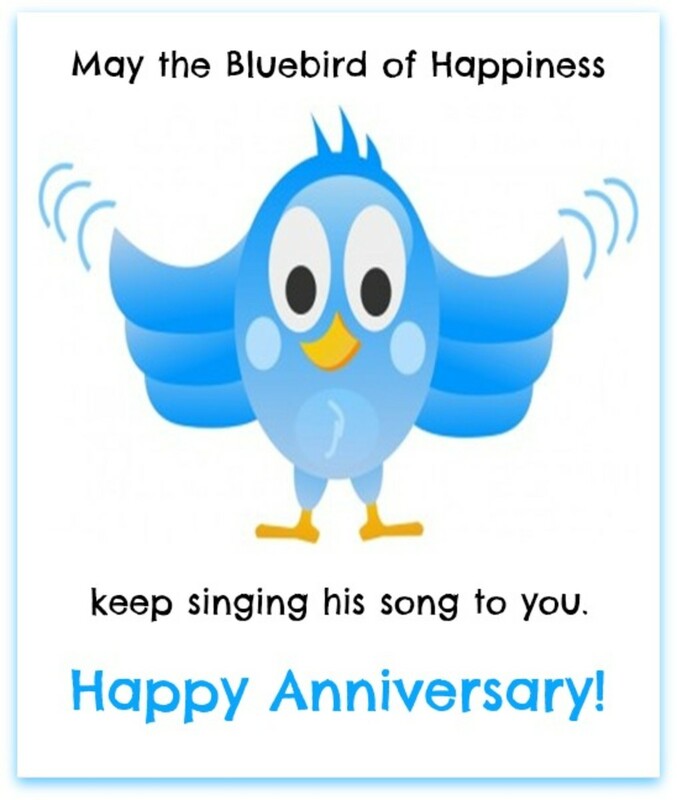 "May the bluebird of happiness keep signing his song to you." 10. 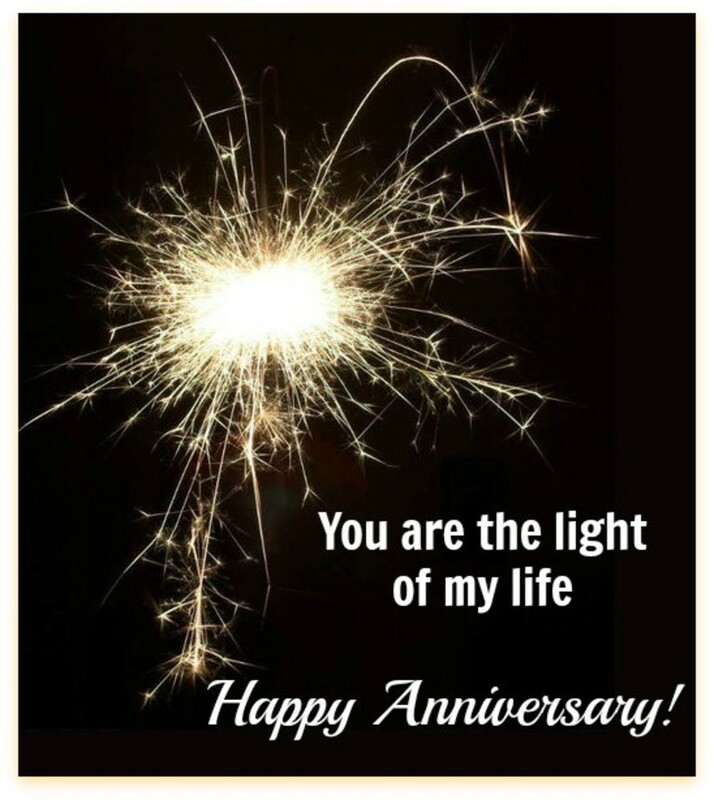 "Happy Anniversary to You!" 11. 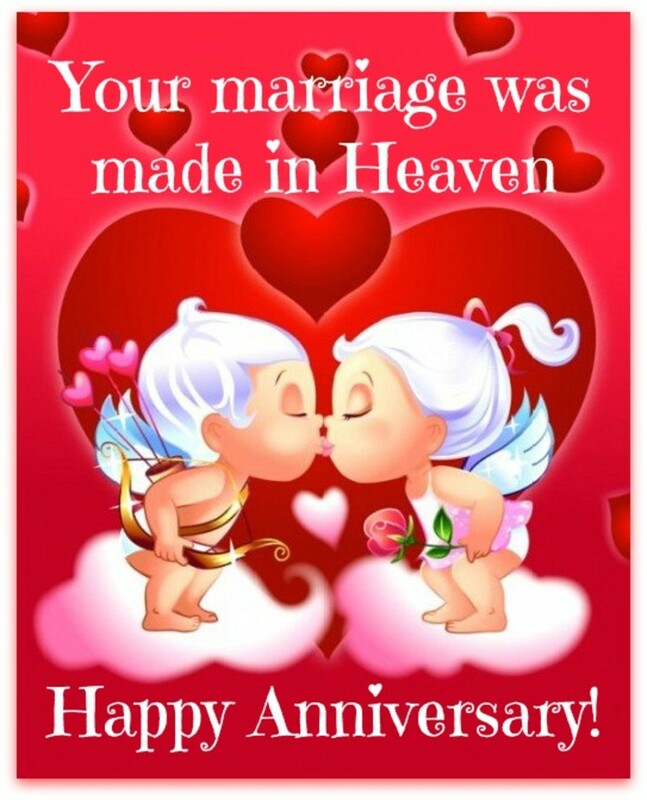 "Your marriage was made in heaven." 12. "You are the perfect couple." 13. 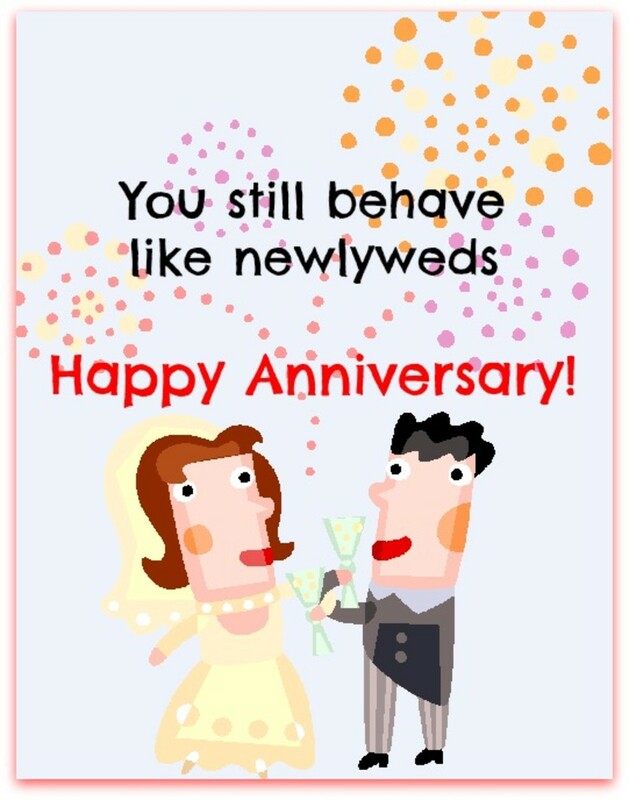 "You still behave like newlyweds." 14. "You make such a cute couple." 15. 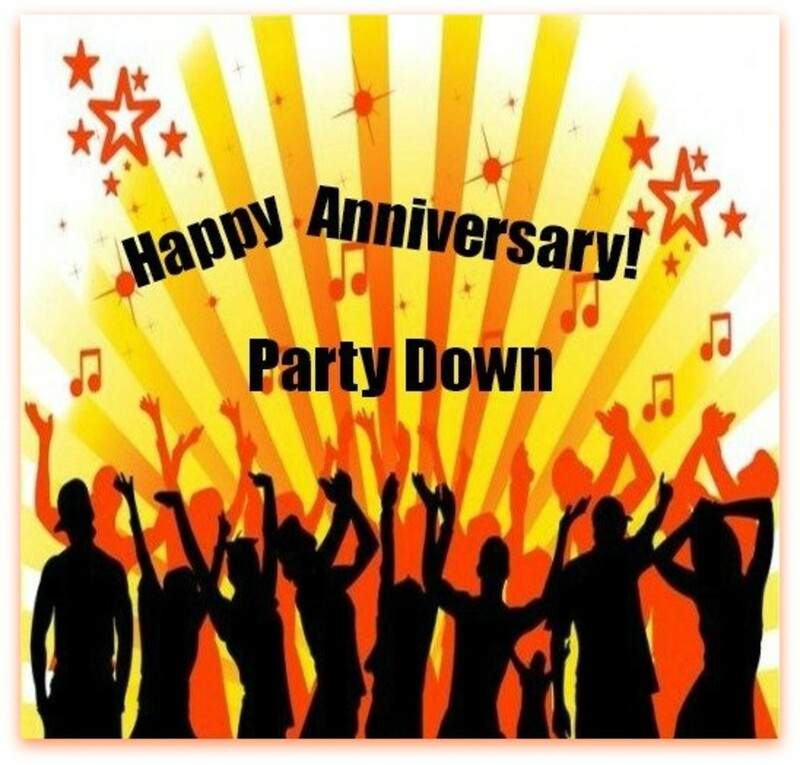 "Happy wedding anniversary – party down!" 16. 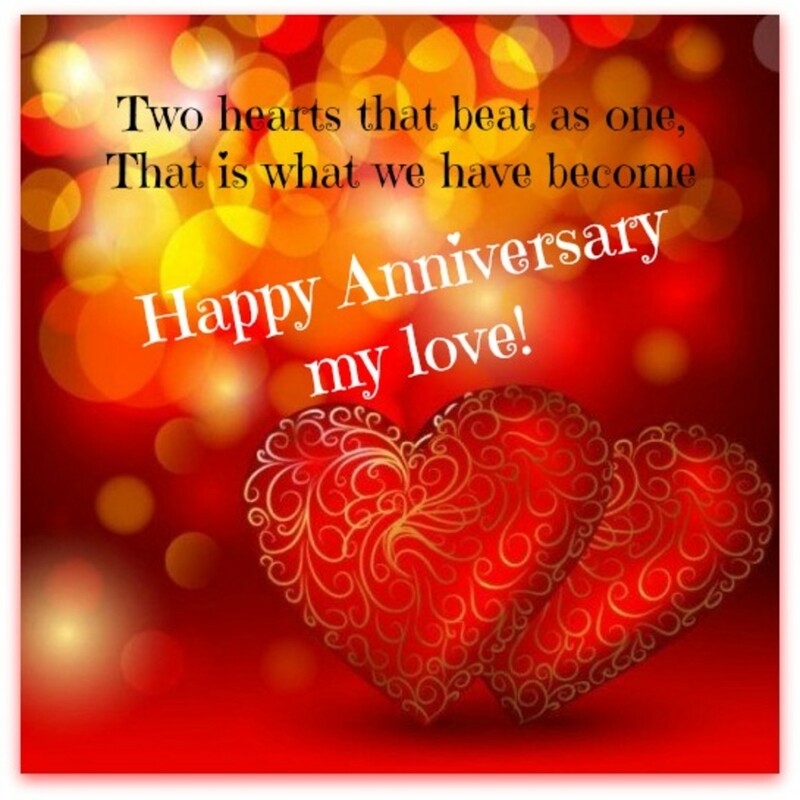 "Happy marriage anniversary – rock on!" 18. "Love is the time that binds you and keeps you." "19. 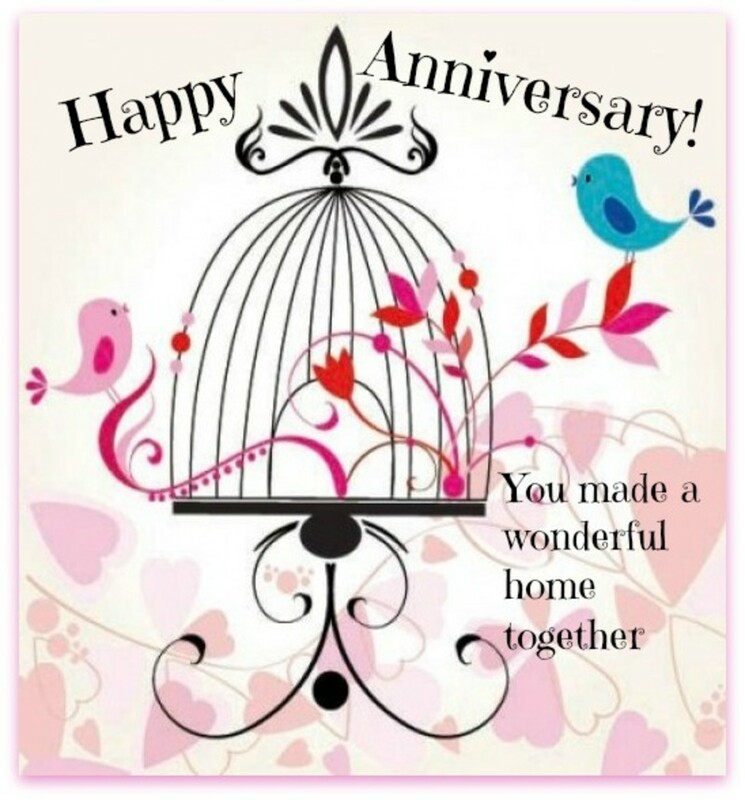 You made a wonderful home together." 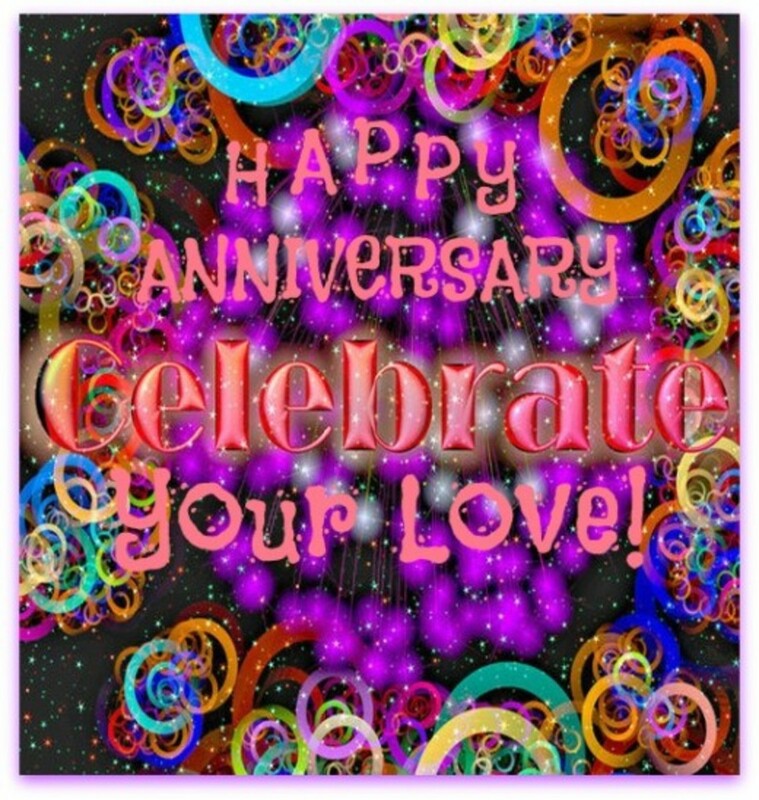 These are the text messages for the 'Happy Wedding Anniversary' messages to send to couples in the graphics above. 1. 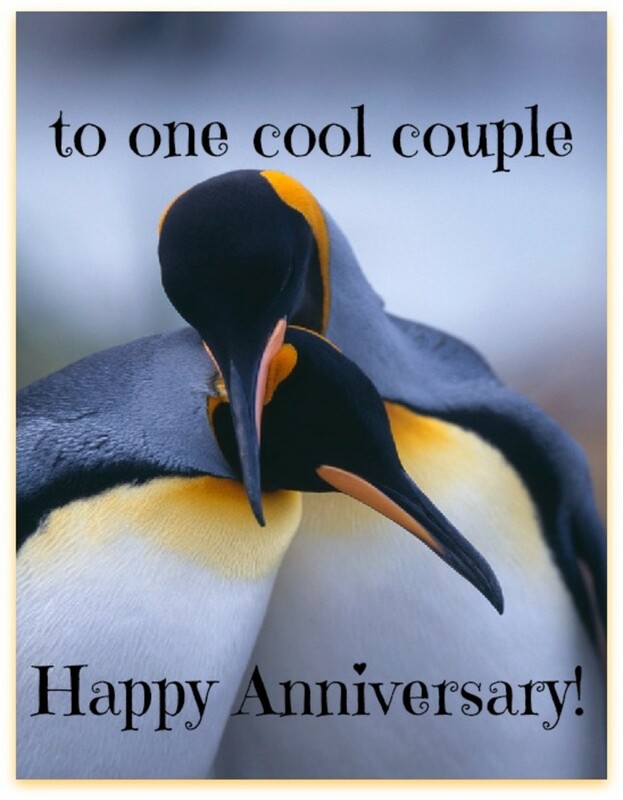 "To one cool couple!" 2. "The happiness you share is a precious gift." 3. "Here's wishing you a fabulous start to another wonderful year together." 4. 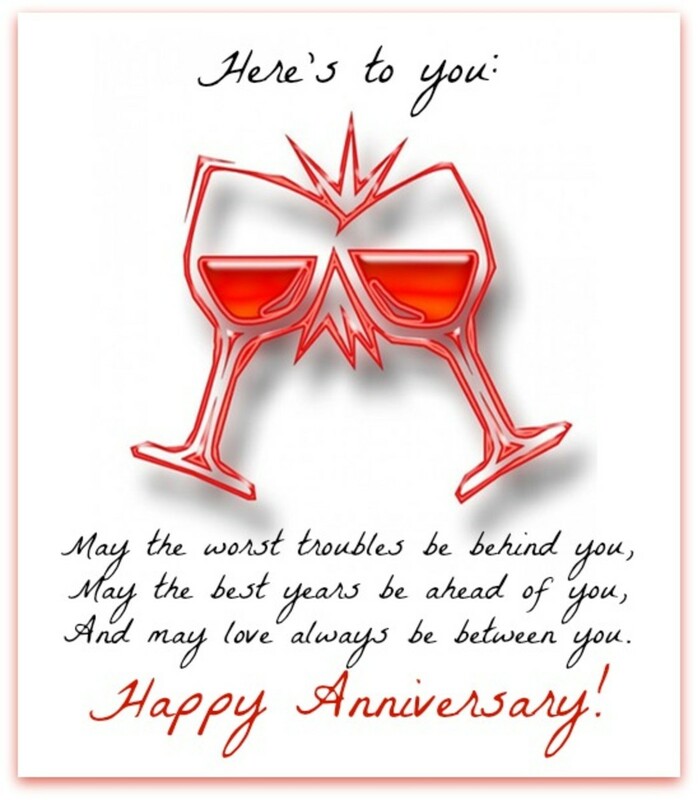 "Here's to you: May the worst troubles be behind you, may the best years be ahead of you, and may love always be between you." 6. "When I look at the two of you, love is what I see"
7. 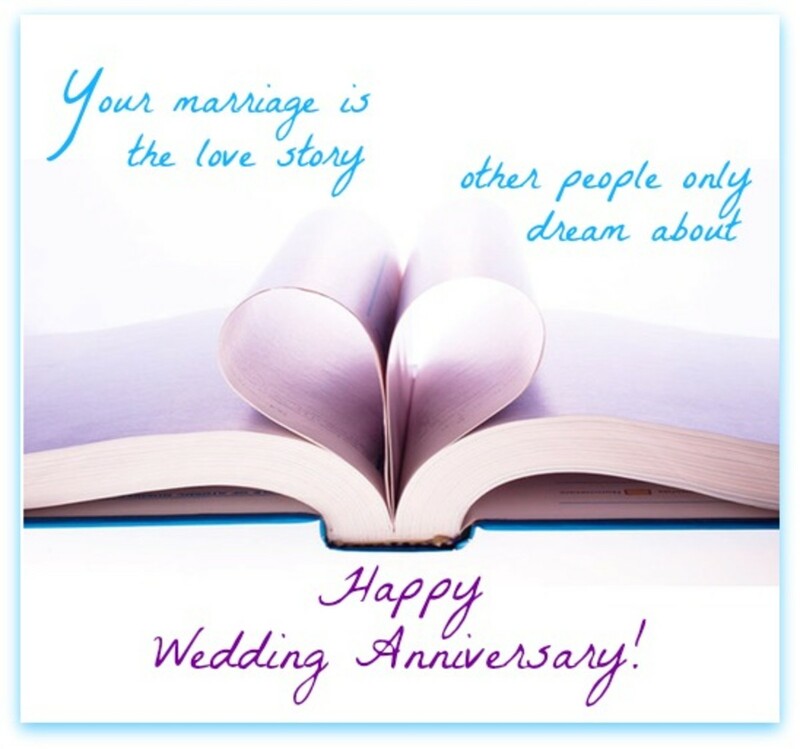 "Your marriage is the love story other people only dream about." 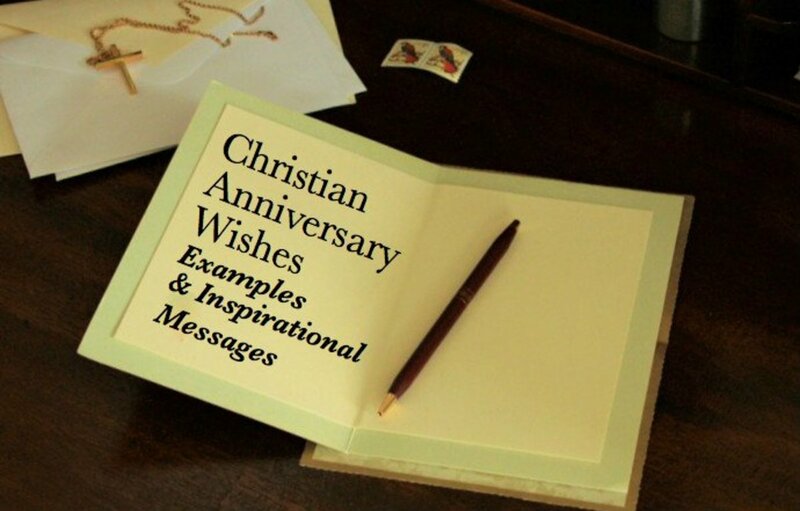 Print these wishes as cards by following the instructions in the video below. You can make a folded card by using your home computer and printer. You can use A4 paper size or 8 1/2" by 11" with regular printer paper or something fancy from an office supply store. 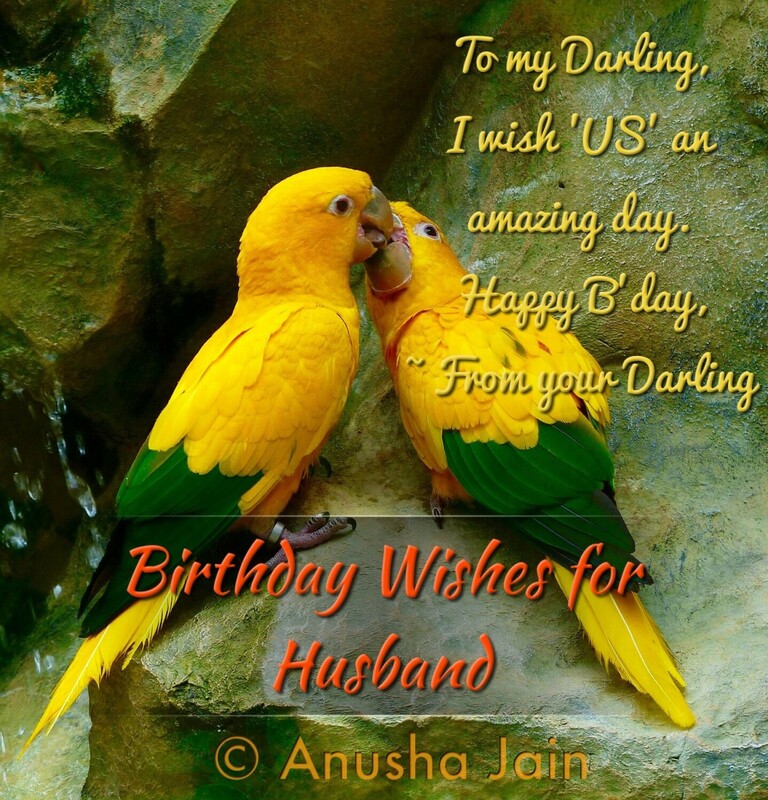 Use one of the image wishes in this collection as the cover and write something personal on the inside of the card. 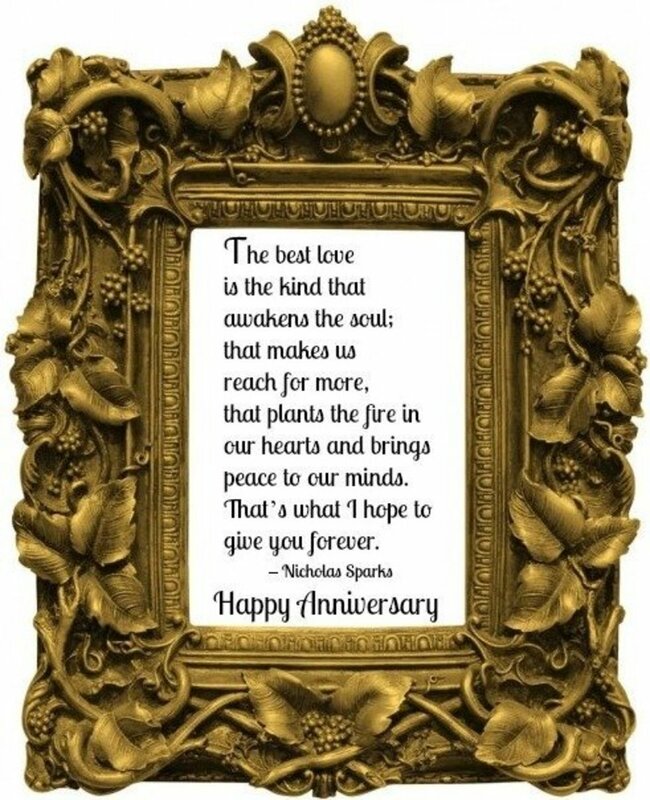 Hope you have a wonderful 2nd wedding anniversary and so many more. We pray that you will. Hi Pinappu: Thanks for the compliments! I create the images and slogans. The images are really time consuming to put together, but it's worth the effort. Just look how many people have 'liked' this webpage on Facebook!!!! 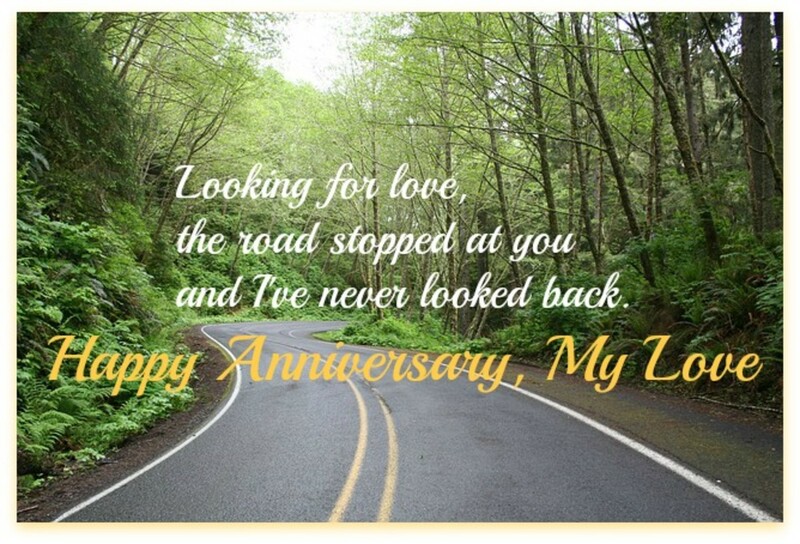 great anniversary wishes and cool photos. From where did you get such beautiful photos? Thank you, Thumbi7. I'm glad you found a card to use. Thanks, Audrey. I appreciate your comment very much and am glad you liked the wishes and graphics. 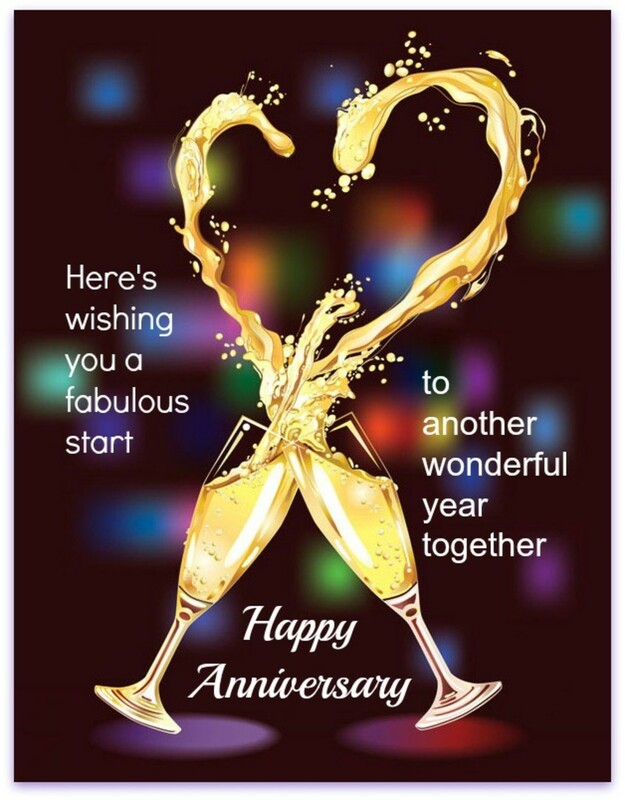 Very cool anniversary wishes--the graphics are great! Thank you, DDE. Glad you enjoy the graphics. Thank you Tillsontitan for your comments and for sharing this. 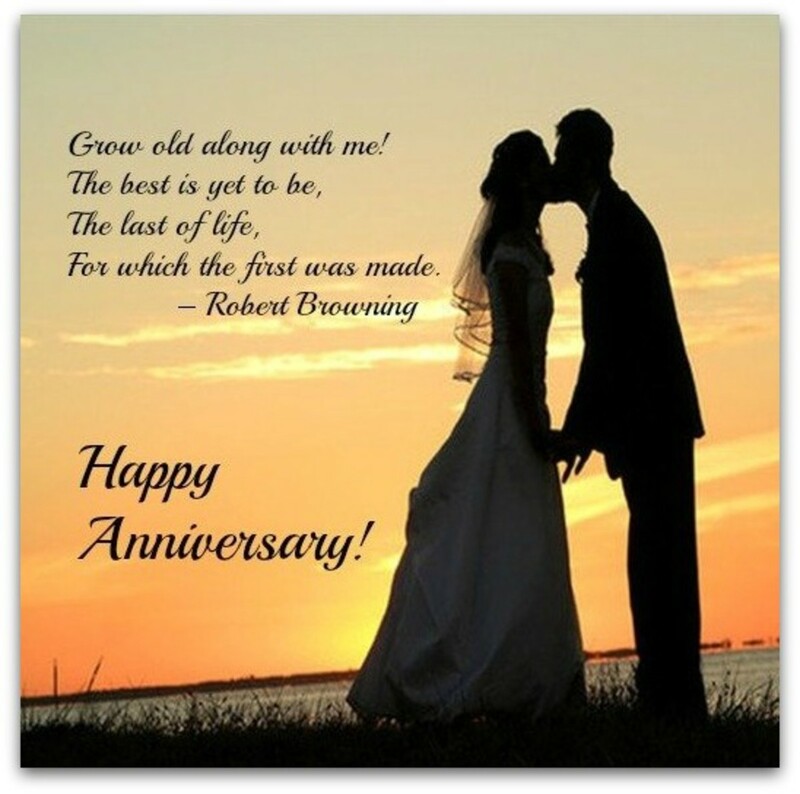 I hope you'll use these anniversary wishes to send greetings. 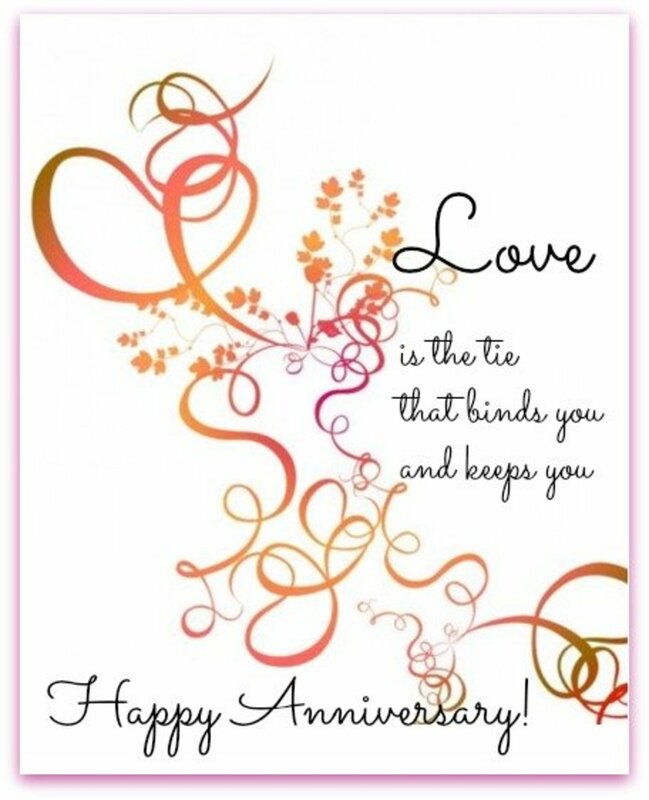 This is a magnificent gathering of great anniversary cards and wishes for just about anybody to you! Superb! Voted up, useful, awesome, beautiful, interesting and shared. 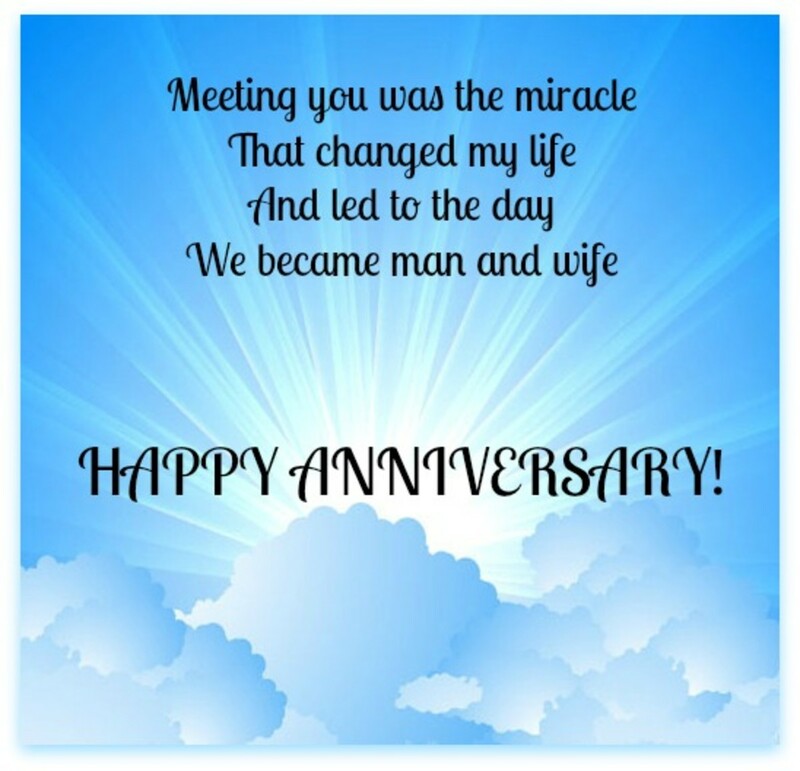 Facebook is great for sharing special life events, like wedding anniversaries. I wouldn't know the date of most friends' anniversaries if they didn't tell me or have a party! 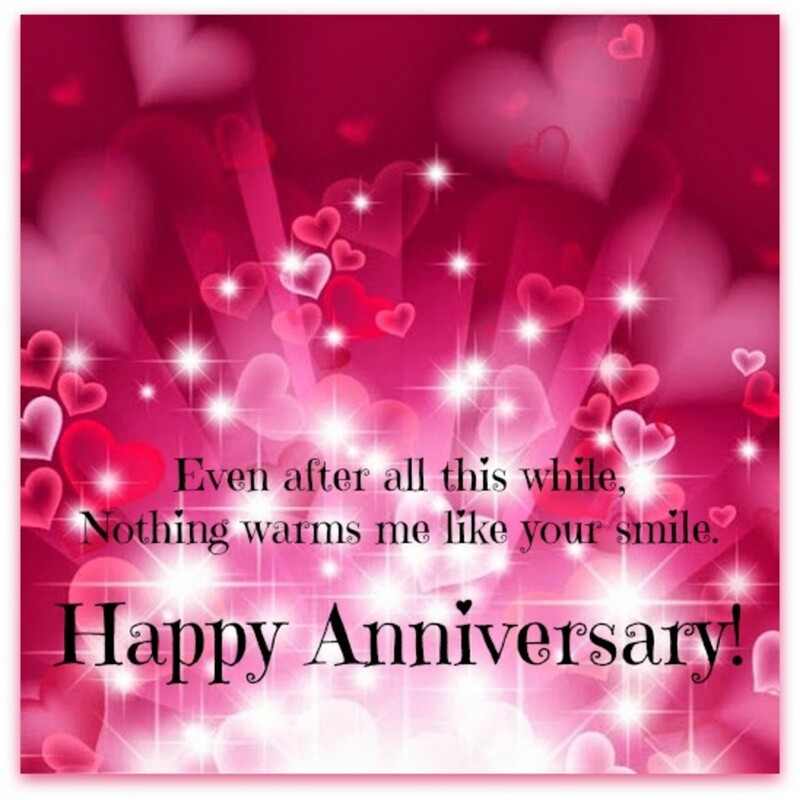 These are nice anniversary images, especially for printing or Facebooking, etc. 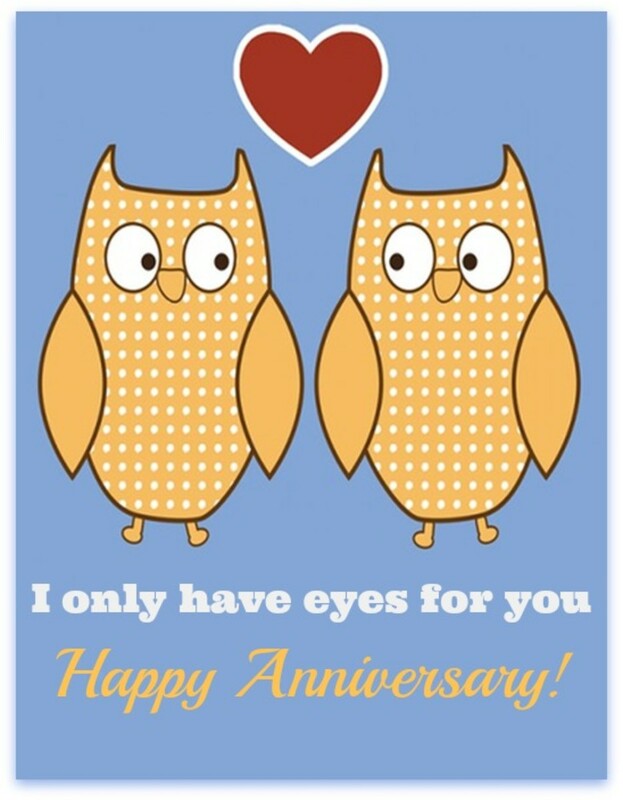 (People are so public these days with their anniversary wishes to one another!) Thanks for sharing these with us. 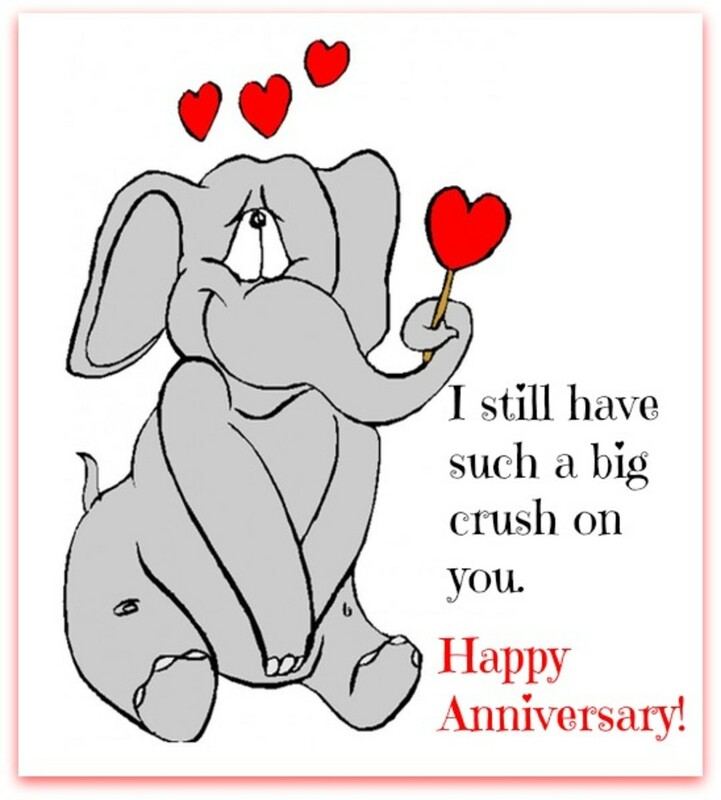 Now, people send more anniversary wishes by email. 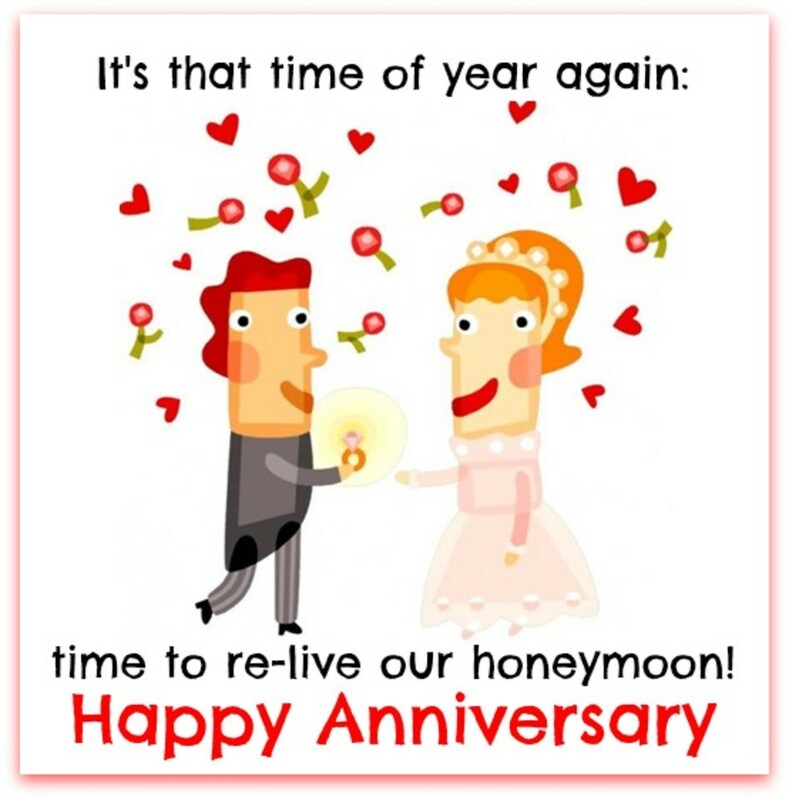 Times change, but wedding anniversaries are still remembered. 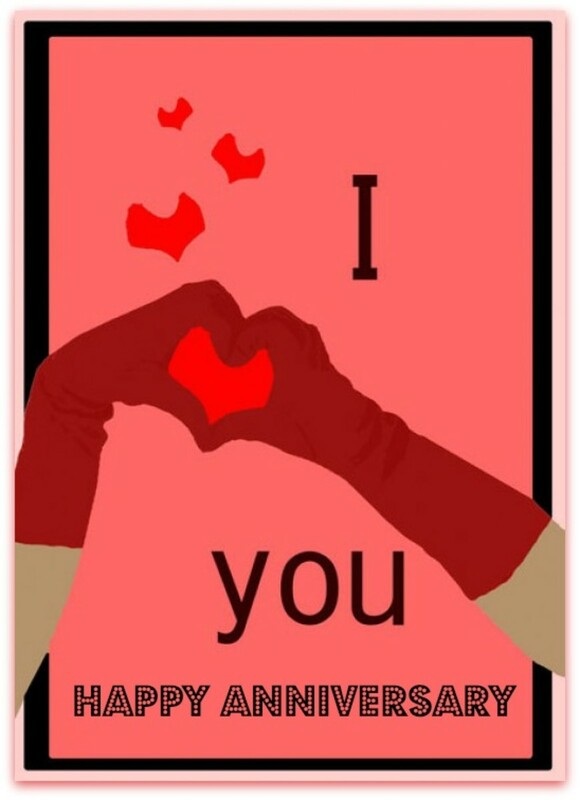 Hi WriterFox, these are great anniversary images. 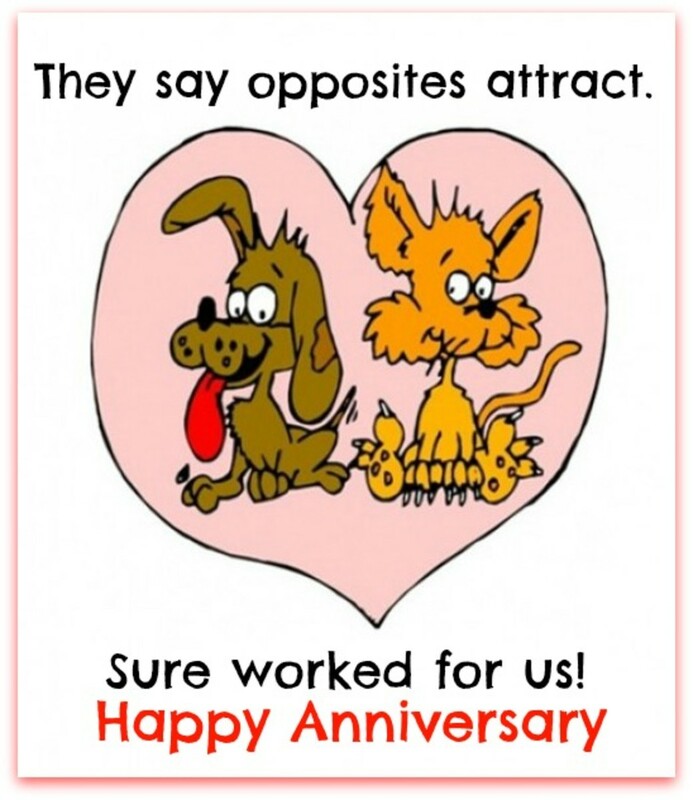 There was a time when people often mailed anniversary cards to couples celebrating these happy occasions.